The capital of an Aramean state, at one time of considerable importance. The statement in I Sam. xiv. 47, that its king fought with Saul, has hitherto been unconfirmed. No such doubt, however, attaches to the account of the war of its king Hadadezer with David, who made the kingdom tributary to Israel (II Sam. x.). In this war Hadadezer brought to his help Arameans from beyond the Euphrates (II Sam. x. 16). 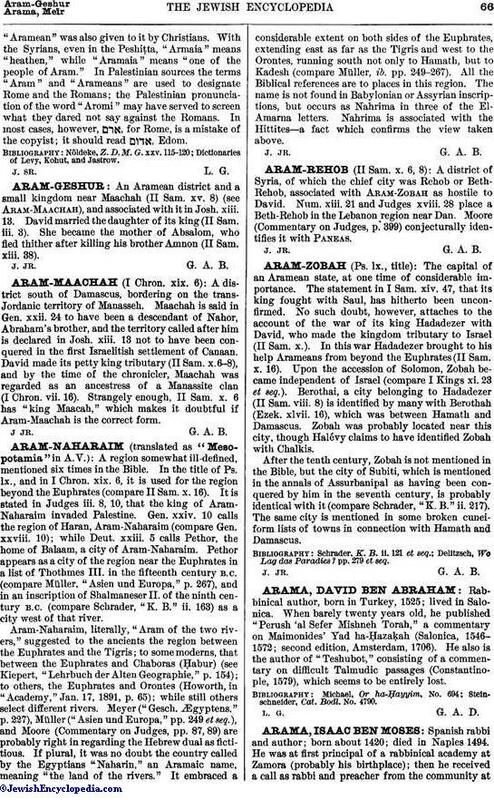 Upon the accession of Solomon, Zobah became independent of Israel (compare I Kings xi. 23 et seq.). Berothai, a city belonging to Hadadezer (II Sam. viii. 8) is identified by many with Berothah (Ezek. xlvii. 16), which was between Hamath and Damascus. Zobah was probably located near this city, though Halévy claims to have identified Zobah with Chalkis. After the tenth century, Zobah is not mentioned in the Bible, but the city of Subiti, which is mentioned in the annals of Assurbanipal as having been conquered by him in the seventh century, is probably identical with it (compare Schrader, "K. B." ii. 217). The same city is mentioned in some broken cuneiform lists of towns in conection with Hamath and Damascus. Delitzsch, Wo Lag das Paradies? pp. 279 et seq.